Simplify multi-tasking in small and medium-sized offices, so you can reach any audience at any time. Use the MP 3055 Black and White Laser Multifunction Printer (MFP) to move information with speed, convenience and reliability. 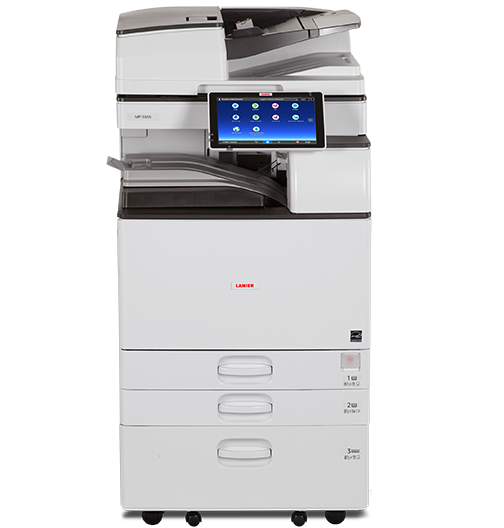 Print and copy black-and-white output at up to 30 pages per minute (ppm). Or, transform paper into digital files and share them instantly via multiple scan-to or paperless faxing options. Use the Automatic Reversing Document Feeder (ARDF) version to copy, scan and fax multi-page documents with ease. Or, choose the high-performance Single Pass Document Feeder (SPDF) version to automate the scanning of two-sided original documents for even faster workflow. Download workflow apps, such as Shared Print Folder or Scan to Me, from the Application Site and put them on the Smart Operation Panel Home Screen for easy one-touch activation. Choose between detailed or simplified user interfaces to find important settings and information via intuitive navigation. Choose from multiple paper sources, including optional Large Capacity Trays to boost paper capacity to 4,700 sheets and extend print runs. Automate everyday tasks by adding optional workflow software, such as GlobalScan™ NX or Streamline NX®. Store up to 3,000 files on the embedded Document Server. With Optical Character Recognition (OCR), you can place metadata on scans and find them quickly using keywords.